It has sometimes been suggested that Spring and Spring Boot are “heavyweight”, perhaps just because they allow apps to punch above their weight, providing a lot of features for not very much user code. In this article we concentrate on memory usage and ask if we can quantify the effect of using Spring? Specifically we would like to know more about the real overhead of using Spring compared to other JVM applications. We start by creating a basic application with Spring Boot, and look at a few different ways to measure it when it is running. Then we look at some comparison points: plain Java apps, apps that use Spring but not Spring Boot, an app that uses Spring Boot but no autoconfiguration, and some Ratpack sample apps. but in the end it doesn’t make a lot of difference to the numbers. We conclude from the analysis below that it would save at most a MB with the stack size we are using. All the Spring Boot webapps we analyse have this same configuration. This includes Spring Boot Web and Actuator starters, plus 3 or 4 webjars for static resources and the webjar locator. A completely minimal Spring Boot application including Spring and some logging but no web server would be around 5MB of jars. To measure memory usage there are some tools in the JVM. You can get quite a lot of useful information from JConsole or JVisualVM (with the JConsole plugin so you can inspect MBeans). Heap usage for our vanilla app is a saw tooth, bounded above by the heap size and below by the amount of memory used in a quiescent state. The average weighs in at roughly 25MB for an app under load (and 22MB after a manual GC). JConsole also reports 50MB non-heap usage (which is the same as you get from the java.lang:type=Memory MBean). The non-heap usage breaks down as Metaspace: 32MB, Compressed Class Space: 4MB, Code Cache: 13MB (you can get these numbers from the java.lang:type=MemoryPool,name=* MBeans). There are 6200 classes and 25 threads, including a few that are added by the monitoring tool that we use to measure them. middle) and a new equilibrium with a lower heap usage. This data is of limited use because you can’t trace the “big” objects back to their owners. For that you need a more fully featured profiler, like YourKit. YourKit does the aggregation for you and presents a list (although the details of how it does that are rather unclear). finding class loader instances ..done. There are loads of “dead” entries, but there is also a warning that the liveness information is not accurate. A manual GC doesn’t get rid of them. You would think that a Linux OS would provide plenty of insight into a running process, and it does, but Java processes are notoriously hard to analyse. This popular SO link talks about some of the problems in general. Lets have a look at some of the tools that are available and see what they tell us about our app. RSS (Resident Set Size) values are in the range 150-190MB according to ps. There is a tool called smem that is supposed to give a more sanitized view, and to accurately reflect non-shared memory, but the values there (for instance of PSS) aren’t that different. Interestingly the PSS values for a non-JVM process are usually ​*significantly*​ lower than RSS, whereas for a JVM they are comparable. The JVM is very jealous of its memory. i.e. over 3GB for a process that we know is only using 80MB. Just counting the ‘—–’ entries gives you nearly all the 3GB. At least that’s consistent with the VSZ numbers from ps, but not very useful for capacity management. Someone commented that the RSS values were accurate on his machine, which is interesting. They definitely didn’t work for me (Ubuntu 14.04 on Lenovo Thinkpad). 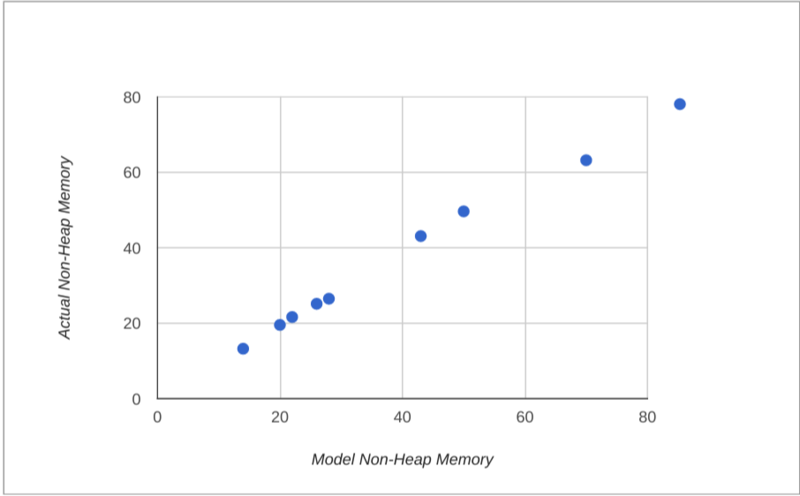 Also, here’s another interesting article on JVM memory stats in Linux. They are all competing for memory resources so it takes them all a while to start, which is fair enough. Once they all start they serve their home pages quite efficiently (51ms latency over a crappy LAN at 99th percentile). Once they are up and running, stopping and starting one of the processes is relatively quick (a few seconds not a few minutes). RSS values are still in the range 150-190MB. If all 40 processes were indepenently using this much memory that would account for 6.8GB, which would blow my 8GB laptop out of the water. It runs fine, so most of that RSS value is not really independent of other processes. We can hypothesize that maybe the PSS number is still hugely inflated by shared read-only memory (e.g. mapped jar files). The 40 processes pretty much filled up the available memory on my laptop (3.6GB before the apps started), and some paging was happening, but not much. We can turn that into an estimate of the process size: 3.6GB/40 = 90MB. Not far off the JConsole estimate. Results: heap 6MB, non-heap 14MB (Code Cache 4MB, Compressed Class Space 1MB, Metaspace 9MB), 1500 classes. Hardly any classes loaded so no surprise really. Heap 12MB (but drops to 6MB after a manual GC), non-heap 26MB (Code Cache 7MB, Compressed Class Space 2MB, Metaspace 17MB), 3200 classes. The graph below shows the heap usage from launching the app to the end state. The big drop in the middle is the manual GC, and you can see that after this the app stabilizes at a different saw tooth. Does Spring Boot itself (as opposed to just Spring) add a lot of overhead to this application? For starters, we can test that by removing the @SpringBootApplication annotation. Doing that means that we load a context but don’t do any autoconfiguration. The result is: heap 11MB (drops to 5MB after a manual GC), non-heap 22MB (Code Cache 5MB, Compressed Class Space 2MB, Metaspace 15MB), 2700 classes. The Spring Boot autoconfiguration premium, measured this way, is about 1MB heap and 4MB non-heap. Going a step further, we can create a Spring application context manually without using any Spring Boot code at all. Doing this drops the heap usage to 10MB (drops to 5MB after a manual GC), non-heap to 20MB (Code Cache 5MB, Compressed Class Space 2MB, Metaspace 13MB), 2400 classes. The Spring Boot total premium, measured this way, is less than 2MB heap and about 6MB non-heap memory. $ lazybones create ratpack . The used heap is pretty low to start with (13MB), grows to 22MB over time. Metaspace is about 34MB. JConsole reports 43MB non-heap usage. There are 31 threads. It runs in about 16MB heap, 28MB non-heap as a Spring Boot fat jar. As a regular gradle application it’s a bit lighter on heap (the cached jars aren’t needed) but uses the same non-heap memory. There are 30 threads. Interestingly there is no object that is bigger than 300KB, whereas our Spring Boot apps with Tomcat generally have 10 or more objects above that level. 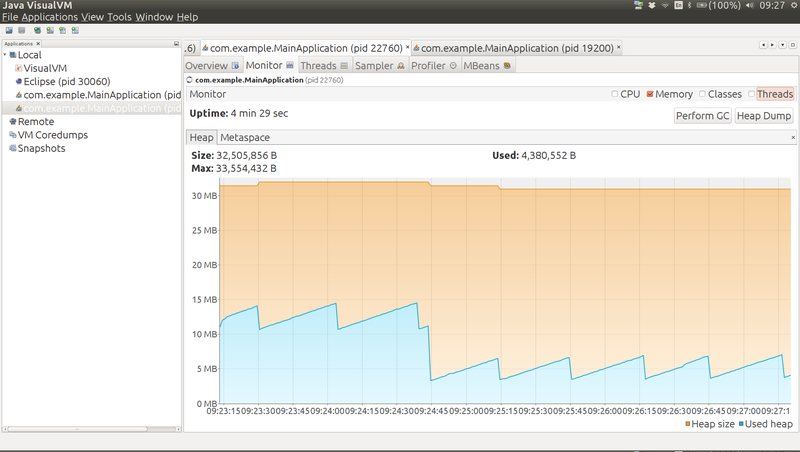 Running from exploded jar shaves up to 6MB off the heap (the difference is cached jar data in the launcher). Also makes startup a bit faster: less than 5s compared to as much as 7s when memory is constrained with the fat jar. A slimmed down version of the app with no static resources or webjars runs at 23MB heap and 41MB non-heap as exploded archive (starts in less than 3s). 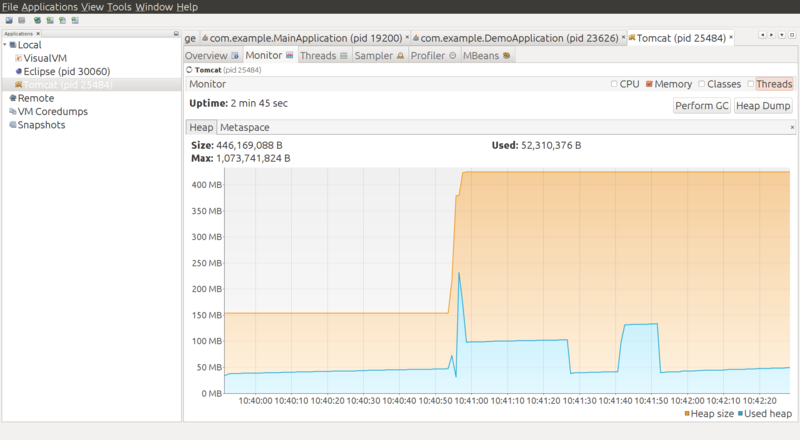 The non-heap usage breaks down as Metaspace: 35MB, Compressed Class Space: 4MB, Code Cache: 4MB. Spring ReflectionUtils jumps to near the top of the memory chart in YourKit with Spring 4.2.3 (2nd only to Tomcat NioEndpoint). The ReflectionUtils should shrink under memory pressure but they don’t in practice so Spring 4.2.4 clears the caches once the context has started, resulting in some memory savings (down to about 20MB heap). DefaultListableBeanFactory drops down to 3rd place and is almost half the size it was with the resource chain (webjars locator) but it won’t shrink any further without removing more features. Using Jetty instead of Tomcat makes no difference whatsoever to the overall memory or heap, even though the NioEndpoint is high on the “Biggest objects” list in YourKit (takes about 1MB), and there is no corresponding blip for Jetty. It also doesn’t start up any quicker. As an example of a “real” Spring Boot app, Zipkin (Java) runs fine with with -Xmx32m -Xss256k, at least for short periods. It settles with a heap of about 24MB and non-heap about 55MB. The spring-cloud-stream sample sink (with Redis transport) also runs fine with -Xmx32m -Xss256k and similar memory usage profile (i.e. roughly 80MB total). The actuator endpoints are active but don’t do much to the memory profile. Slightly slower startup maybe. Instead of using the emedded container in Spring Boot, what if we deploy a traditional war file to a Tomcat container? The container starts and warms up a bit and uses of order 50MB heap, and 40MB non-heap. Then we deploy a war of the vanilla Spring Boot app, and there’s a spike in heap usage, which settles down to about 100MB. We do a manual GC and it drops down to below 50MB, and then add some load and it jumps up to about 140MB. A manual GC drops it back down to below 50MB. So we have no reason to believe this app is really using much if any additional heap compared to the container. It uses some when under load, but it can always reclaim it under GC pressure. 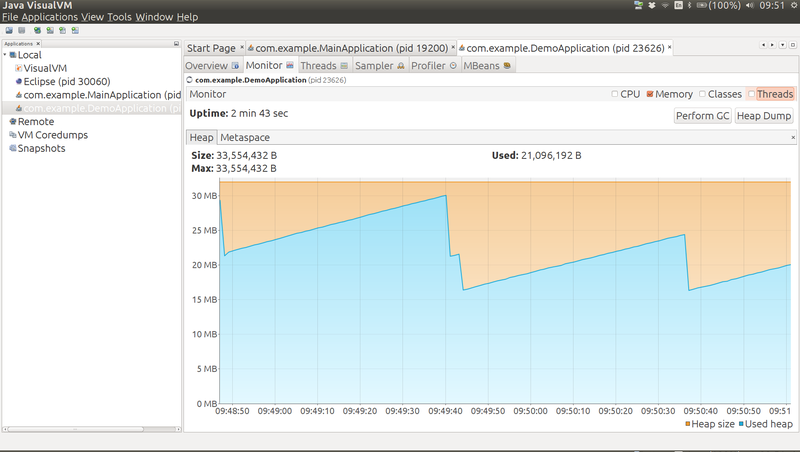 Metaspace, however tells a different story, it goes up from 14MB to 41MB in the single app under load. Total non-heap usage is reported at 59MB in the final state. If we add another copy of the same application to the Tomcat container, trough heap consumption goes up a bit (above 50MB) and metaspace is up to 55MB. Under load heap usage jumps to 250MB or so, but always seems to be reclaimable. Then we add some more apps. With six apps deployed the metaspace is up to 115MB and total non-heap to 161MB. This is consistent with what we saw for a single app: each one costs us about 20MB non-heap memory. Heap usage hits 400MB under load, so this doesn’t go up proportionally (however it is being managed from above, so maybe that’s not surprising). The trough of heap usage is up to about 130MB, so the cumulative effect of adding apps on the heap is visible there (about 15MB per app). When we constrain Tomcat to the same amount of heap that the six apps would have in our vanilla embedded launch (-Xmx192m) the heap under load is more or less at its limit (190MB), and the trough after a manual GC is 118MB. Non-heap memory is reported as 154MB. The heap trough and non-heap usage is not identical but consistent with the unconstrained Tomcat instance (which actually had a 1GB heap). Compared to the embedded containers the total memory usage, including the full heap, is a bit smaller because some of the non-heap memory is apparently shared between apps (344MB compared to 492MB). For more realistic apps that require more heap themselves the difference will not be proportionally as big (50MB out of 8GB is negligible). Also any app that manages its own thread pool (not uncommon in real life Spring applications) will incur an additional non-heap memory penalty for the threads it needs. The vanilla app loads about 6000 classes and the do nothing Java main loads about 1500. The estimate is accurate for the vanilla app and the do nothing Java app. Adding Spring Cloud Eureka discovery only loads about another 1500 classes, and uses about 40 threads, so it should use a bit more non-heap memory, but not a lot (and indeed it does use about 70MB with 256KB stacks, where the rule of thumb would predict 63MB). The effect Spring Boot on its own has on a Java application is to use a bit more heap and non-heap memory, mostly because of extra classes it has to load. The difference can be quantified as roughly an extra 2MB heap and 12MB non-heap. In a real application that might consume many times as much for actual business purposes this is pretty insignificant. The difference between vanilla Spring and Spring Boot is a few MB total (neither here nor there really). The Spring Boot team have only just started measuring things in this level of detail so we can probably expect optimizations in the future anyway. When we compare memory usage for apps deployed in a single Tomcat container with the same apps deployed as independent processes, not surprisingly the single container packs the apps more densely in memory. The penalty for a standalone process is mainly related to non-heap usage though, which adds up to maybe 30MB per app when the number of apps is much larger than the number of containers (and less otherwise). We wouldn’t expect this to increase as apps use more heap, so in most real apps it is not significant. The benefits of deploying an app as an independent process following the twelve-factor and Cloud Native principles outweigh the cost of using a bit more memory in our opinion. As a final note, we observe that the native tools in the operating system are not nearly as good as the ones provided by the JVM, when you want to inspect a process and find out about its memory usage.